March and April stand as my least favorite months to fly. For one, the still dormant landscape is usually an uninspiring brown that makes for poor photographs and mediocre sight seeing. A more important reason is uncertainty in the weather. At least winter usually lives up to, and occasionally exceeds, my expectations. But March and April are quite literally like Forrest Gump's over-referenced box of chocolates: you never know what you're going to get. Rain, thunderstorms, snow, sleet, turbulence, icing, and gusty winds -- sometimes all on the same day -- are mainstays for these two fickle months. The atmosphere at this time of year is always palpably unsettled. For any light aircraft pilot planning a cross country flight during this time, it is all quite...well...unsettling. Despite this, sometimes the time is right for a trip. The trick lies in determining if the weather will permit it. The Bear first met my Dad, her Grandfather, during an April flight south from Le Roy, NY to Knoxville, TN in 2009 that was deferred once because of weather. Through the years, the airplane has been the bridge that has helped maintain that family connection, but our last flight to Tennessee was in 2011 and our last visit (by car) was in 2013. Though we have met Dad in Michigan more recently, we were long overdue for a visit. My hope was to depart on Good Friday and return the following Monday, but the weather forecast was not cooperating. I studied it for a time, trying to plan around inconvenient weather events anticipated on both the departure and return days. As is often the case, I realized that simply shifting the entire trip one day later should resolve the issue. The Saturday following Good Friday was forecast to be severe clear from New York to Tennessee and the long range outlook for Tuesday was far more promising than Monday. Therein lay as solid a plan as one can hope for this time of year. On waking, my first sense of Saturday morning was the exuberant trill of birdsong. Though still dark outside when I woke, blushing hues of morning sunlight were soon warming our home. I briefed the flight again that morning, finding Rochester, our planned lunch stop in West Virginia, and Knoxville all under clear skies and forecast to remain that way throughout the day. Halfway to the airport, we passed under a 2100 foot overcast shrouding the field. No problem, I thought naïvely. 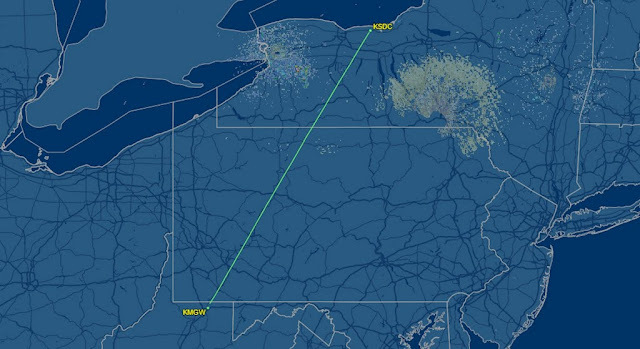 We'll launch, fly to the edge of this obviously localized cloud cover, get on top, and call Rochester Approach for our clearance. As it was freezing at ground level, I had no desire to climb directly though the clouds. We launched, rising above the treeline to see that the cloud cover was actually quite extensive, with only a hole over Rochester illuminating the city skyline like a spotlight. I had fallen prey to confirmation bias (shame on me). The forecast called for a clear sky, I awoke under a clear sky, and so assumed that the cloud cover over the airport was a localized phenomenon. But no, it was the clear sky over Rochester that was aberrant! A satellite photo would have told me everything I needed to know had I looked at one during my weather briefing. Despite the time and effort that I invested in briefing the weather, complacency still struck. As I pondered my next move, two things were apparent. First, the cloud layer appeared to be relatively thin judging from the bluish tint of sky visible through it. Second, the air was actually warming as we gained altitude. Though I had paid close attention to the forecast freezing level, I did not scan the temperatures aloft looking for inversions. I contacted Rochester Approach from 2200 feet, hoping that we were above the unpublished minimum vectoring altitude (MVA) for the area. We were. I obtained our IFR clearance to 6,000 feet and immediately climbed through the layer. We picked up no ice and, as we climbed, we confirmed the existence of a temperature inversion. The air temperature at our cruise altitude of 6,000 feet was high enough to cause the engine to run a bit warm with the oil cooler winterization plate installed (I removed it on the ground at our first stop). As we rose through the overcast, the gloom brightened gradually until we burst from the ceiling into a brightly lit realm domed by crisp cerulean sky. For a moment, my eyes stung from the sudden onslaught of unfettered sunlight. Looking to the right, I observed the Warrior's shadow highlighted by a magnificent glory at the leading edge of the wing. It dwindled rapidly as we climbed higher above the clouds upon which it was painted. The phantom aircraft flew with us in close formation for the duration of our flight over a shrouded New York State. There was no end in sight to the overcast. Though we were only in instrument conditions for a couple of minutes, those few moments made the entire trip to Knoxville possible. In my VFR-only days, this would have been a no-go, a cancellation made all the more frustrating by the forecast for CAVU weather. Scenarios like this are exactly why I earned my instrument rating. Southbound, the three of us settled in for a smooth flight over the clouds. The Bear approached this journey with a fully developed entertainment strategy. She planned to alternate between reading, playing games, and watching videos so as not to develop any "entertainment fatigue" (my term) from any one source of amusement. Whenever I turned around to look at her, she worked to entertain me with goofy faces, which was sweetly thoughtful. The clouds disappeared once we reached central Pennsylvania and the landscape greened visibly. Crossing over Morgantown, WV, I was surprised at the size of the stadium at West Virginia University. Landing at Clarksburg, WV, photo by Kristy. We stopped halfway to Knoxville for lunch and fuel ($4.21 with $0.25 Easter weekend discount) in Clarksburg, WV. It was a towered field with a rather geographically precise name: North Central West Virginia Airport (KCKB, new airport #166). Parker's on the Runway, the on-field diner was reputed to be decent. Radar track from Sodus to Clarksburg, courtesy of FlightAware. We were marshaled to parking and greeted by a pair of linemen from V1 Aviation. I asked them about the "golf domes" farther north on the ramp. One explained that Bombardier had a repair facility on the field for CRJ maintenance. So that would explain all the CRJs parked at an airport with only a single commercial gate, wouldn't it? His counterpart opined in a West Virginia drawl that the domes probably housed alien spacecraft. Secretly, I liked this explanation better. Parker's on the Runway occupied the second floor of the commercial terminal building, giving patrons a commanding view of the ramp and runway. The decor was modest, but I really liked the squadron of airplane lamps hanging over the lunch counter. The Bear perused her menu and made a precedent-setting choice that endured for our entire vacation. She ordered chicken fingers. With one exception, she insisted on ordering chicken fingers everywhere we ate during our journey south. For The Bear, our aeronautical odyssey became a hunger-fueled chicken finger binge that surely decimated chicken finger availability from New York to Tennessee. I pitied all of those mythological chickens who lost their fingers to appease The Bear's ravenous appetite and "selective" palate. Kristy and I opted for hamburgers. The food was decent and the staff friendly. Parker's was a good, if not necessarily inspired, stop. Lunchtime entertainment involved the arrival of this Black Hawk for fuel. I was glad to see them carefully taxi away from my airplane before throttling up for departure. Once adequately fueled herself, The Bear resumed her hi-jinks in typical fashion. Does making bunny ears count as an actual phase of childhood development in the same way that fascination with knock-knock jokes does? 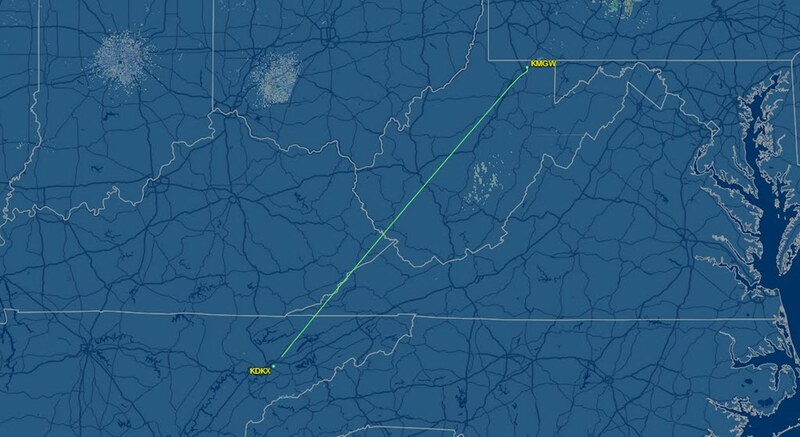 I confess that most of what I know about West Virginia is confined to (1) a John Denver song and (2) what we have observed over years of flying over. Like parts of Pennsylvania, the terrain is significant and lushly verdant during the warmer months of the year. Civilization seemed to coalesce in valleys where the land was flat enough to accommodate it. But flying over in an airplane also reveals the impact of mankind on the landscape. We saw many deforested areas, open mines, and areas where entire hilltops were sheared off from the wounded Earth. West Virginia was obviously a naturally beautiful place, but mankind's search for the Earth's riches had left many scars across the surface. At one point, I looked straight down to observe a peculiar football field surrounded by brownish landscape and completely isolated from any other obvious civilization. Both end zones on the field claimed this gridiron as territory of the "MINERS", fitting with the heavily worked landscape in the vicinity. Our route of flight brought us along the Virginia-Kentucky border with more dramatic terrain that occasionally threw turbulent punches at the Warrior. Indy Center granted a climb to 8,000 feet, but this did little to ease the bumps and mostly subjected us to a stronger headwind. The climb was a nice try, but ultimately worked against us. Our destination was the Knoxville Downtown Island Airport (DKX), known to many locals by its former name, "Island Home Airport". For us, the latter is more fitting as the field has been home to us us on multiple visits to see Dad. The field is quite active and hosts a large number of based aircraft. Fuel was an incredible $3.74/gal and the overnight parking fee for the Warrior was a reasonable $5/night with the first night waived after fuel purchase. Frankly, with the low fuel price, we came out well ahead regardless of the overnight fees. 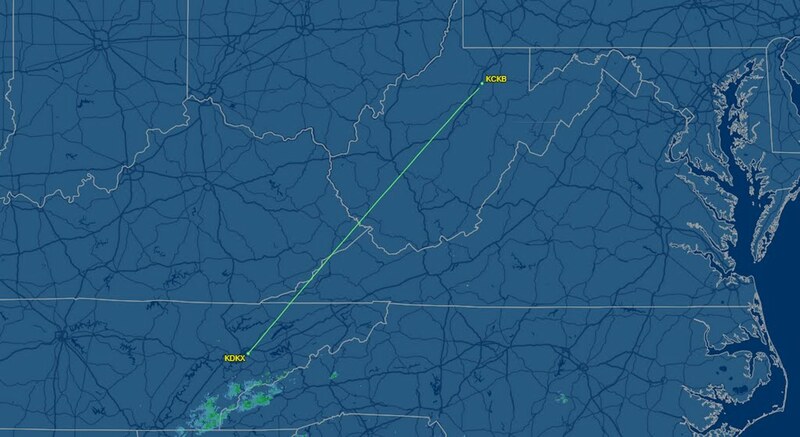 Radar track from Clarksburg to Knoxville courtesy of FlightAware. During our visit, we indulged in the usual Easter activities like coloring eggs and making The Bear seek them out around the house. The Bear claims to still believe the Easter Bunny shtick, but we suspect that she knows who really hides those eggs. The yolk was on her this year. Though I usually hide the eggs, Dad and Carol woke early and beat me to it. We spent part of Easter Sunday at a local playground where The Bear and I practiced some low level formation flight. We took the mandatory family photos, some goofier than others. Frankly, The Bear spent much of the visit entertaining Dad and Carol with her wacky side (and, unfortunately, the occasional mealtime hissy fit). I spent one afternoon at a park playing tag with The Bear and a little boy who randomly attached himself to us. Dad and the boy's mother watched, laughing, as the two chased me over, under, and around the playground equipment. It's been a long time since I've moved that fast on a playground. Don't even ask. Move along, nothing to see here. Suffice it to say that we had a great visit. The decision not to return home on Monday, March 28th was a good one. Rochester was low IFR, awash in rain, and subject to high wind. The forecast for Tuesday morning was outstanding, though Rochester was still expecting gusty wind. The morning of our intended departure, I briefed the flight again and became concerned. The entire state of West Virginia was under an AIRMET for icing between 4,000 and 8,000 feet. Icing probability was high and anticipated to be severe. This would not be a problem unless we flew through any clouds, but ceiling forecasts indicated low ceilings across the entire state and area forecasts estimated the tops to range from 5,000 feet to 13,000 feet depending on location. There was also an AIRMET for moderate turbulence whose western boundary roughly coincided with our planned route of flight across Pennsylvania and New York. The best case scenario was that the clouds might remain below our filed 7,000 foot cruise altitude and we would have no problems. The worst case scenario was that we would encounter a wall of clouds over West Virginia reaching higher into the heavens than we could fly and, with that icing AIRMET and the expected freezing levels aloft, there was no way that I would attempt going through them. So I developed and briefed a backup plan involving a route through Ohio where the weather was anticipated to be much better. We would make the decision in the air upon reaching West Virginia. There are a lot of little decisions that stack up into the ultimate choice to go or not, especially during this unsettled time of year. One of the most important decisions, regardless of season, weather, or terrain is to always leave yourself an "out". When we arrived around 7:30 Tuesday morning, Downtown Island Airport was slowly warming up under a reddish sun as the overnight ground fog dissipated. Warrior 481's aluminum skin was covered with cold dew. My Dad has always seemed a bit dubious about my love of flying, but he showed a lot of interest and asked several practical aviation questions on this visit. He immediately started working to untie the airplane when we arrived and helped me shake the excess dew off the cover before we stowed it in the baggage compartment. Maybe I will be able to convince him to go for a ride one of these days. Hugs were exchanged all around and we boarded our ship for the flight home. It was cold and the Warrior started grudgingly. We idled for a time, waiting for the engine to warm enough for the defroster to bake the opaque fog from the windscreen before taxiing for departure. The sky over Knoxville was magnificently clear. Even though Knoxville Approach can be reached from the ground, I chose to pick up our IFR clearance in the air. 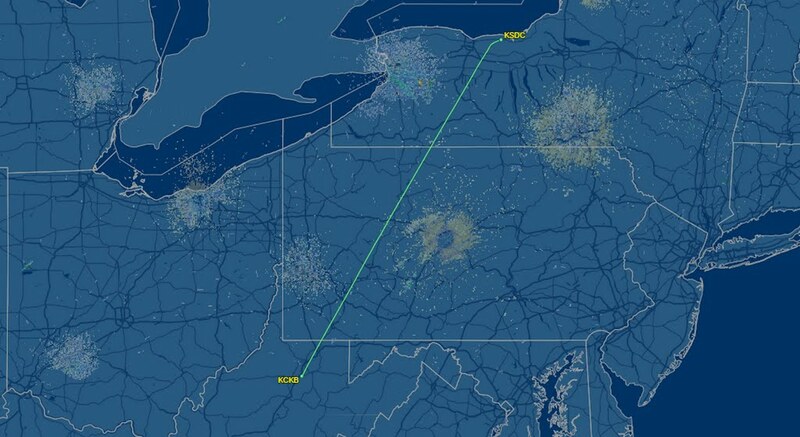 We were promptly cleared for a climb to our filed cruise altitude of 7,000 feet. That morning's flight leg was the most beautiful of the trip as we flew over fog enshrouded mountains, their unique crenelated features showing crisply though the clear morning air. By the time we reached West Virginia, we found ourselves skimming the top of a cloud deck. Though the overcast climbed higher as the day developed, we had only momentary encounters with the clouds. As we neared Charleston, WV, I was struck by the sight of civilization shoehorned into the Kanawha River valley, tightly bounded by the surrounding terrain. Charleston's Yeager Airport was doing brisk business that morning, a heartening improvement over Saturday when a fatal airplane accident closed the field as we transited their control area. Our lunch stop on the northbound trek was Morgantown, WV (new airport #167), a towered field with a rather unique airport diner. Most airport diners skew toward the greasy spoon, with certain notable exceptions like Cloud 9 in Williamsport, PA. However, Morgantown, a college town in northern West Virginia, boasts Ali Baba, an unlikely, but well-loved Mediterranean restaurant in the airport terminal. On descent into Morgantown, we passed through a small, non-threatening looking cloud that shook the Warrior like a terrier with a chew toy in its mouth. All three of us were flung upward out of our seats (no injuries thanks to the seat belts) and our ship rolled into a steep bank. Still in IMC, I twisted and pulled on the controls until the instruments showed the correct attitude again. A moment later, we emerged back into clear sky and the ride immediately smoothed out again. I make it my goal to never do anything with the airplane that causes my wife to make the sound that she made in that moment. Even The Bear, who is usually apathetic to turbulence, was alarmed by the surprise jolt and was observed clinging to the airplane's window frame afterward. The 5200 foot long runway at Morgantown was a very welcome sight, gusty wind and all. 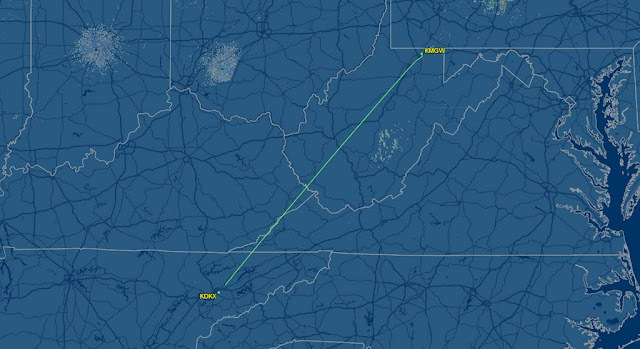 Ground track from Knoxville to Morgantown, courtesy of FlightAware. I was raised on a blandly typical Midwestern diet of steak and potatoes (and, also being a child of the 1970s, there was an unfortunate amount of McDonald's thrown in). In graduate school, I discovered to my delight that other cultures actually attempt to flavor their food. I became an enthusiastic connoisseur of Chinese (a gateway ethnic food), Indian, and Thai food. As we disembarked from the Warrior, the nuanced aroma of non-Western cooking scented the air. It was very incongruous with the the airport environment, but set my stomach to rumbling. We put in a request for fuel ($4.70/gal) and made our way to Ali Baba. Ali Baba looked nothing like the typical airport diner. It was rather nicely appointed in a culturally fitting way. If it were not for the large turbine aircraft parked directly outside our window, it would have been easy to forget that we were at an airport. The restaurant was doing a brisk Tuesday lunch business. An older gentleman, presumably the owner, was working the room; welcoming diners and interacting on a personal level with his regulars. Kristy and I opted for the lunch buffet, which featured salad, soup (a yummy tomato basil), fresh fruit, pitas and hummus, gyro fixings, falafel (the falafel was fantastic and we went back for seconds), spicy roasted vegetables, and more. Lunch was delicious and very satisfying. The Bear, of course, ordered chicken fingers. Despite our dismay over this choice, even Kristy admitted that the French fries that came with her meal were a cut above. As we prepared to depart, The Bear treated us to this impression of three llamas eating lunch in a Mediterranean restaurant. It was very convincing. Llama at the Binder Park Zoo, 6 July 2011. See? It was clearly a spitting image! Though filed for 7,000 feet, we were initially cleared only to 6,000, presumably to remove a traffic conflict. This put us directly at the level of the scattered cloud deck and we spent the first several minutes of the flight punching in and out of cumulus. Kristy was more than a little anxious about this after our experience prior to landing in Morgantown, but there were no more surprises lurking in the clouds. Finally, we were cleared to 7,000 and into clear air. Much like our flight south, the return trip featured steadily increasing headwinds (in fact, the outgoing and return flights were of the exact same duration). And that AIRMET for turbulence? We found it. The sky cleared over central Pennsylvania and remained that way to Sodus, but we were subject to strong up and down drafts during the final slog home. We landed at Sodus with the wind direction highly variable, but favoring the northwest and blowing at 7 knots gusting to 17. I kept our speed up and flew the Warrior smoothly onto the runway in a right slip. Kristy was impressed with the landing and actually told me so. the turbulence, I hand-flew a nice, straight course. altitude. That would have significantly reduced my workload. Number of llama companions at lunch: 3? With an Instrument Rating and the ability to enter the clouds comes the potential to get into trouble in ways that simply cannot occur when flying VFR. In this relatively new context, the journey provided great experience in planning multi-state cross country trips during my least favorite flying months of the year.